Massachusetts Marijuana Business Bonds • Surety One, Inc.
A Marijuana Cultivator may cultivate, process and package marijuana, to transfer and deliver marijuana products to marijuana establishments, but not to consumers. Licensing is of cultivators is by "canopy" or size of mature plant cultivation in square feet. A Craft Marijuana Cooperative is a type of Marijuana Cultivator which may cultivate, obtain, manufacture, process, package and brand marijuana and marijuana products to deliver marijuana to Marijuana Establishments, but not to consumers. A Marijuana Product Manufacturer is an entity authorized to obtain, manufacture, process and package marijuana and marijuana products, to deliver marijuana and marijuana products to Marijuana Establishments and to transfer marijuana and marijuana products to other Marijuana Establishments, but not to consumers. A Marijuana Retailer is an entity authorized to purchase and deliver marijuana and marijuana products from Marijuana Establishments and to sell or otherwise transfer marijuana and marijuana products to Marijuana Establishments and to consumers. A Marijuana Transporter is an entity that may only transport marijuana or marijuana products when such transportation is not already authorized under a Marijuana Establishment license if it is licensed as a Marijuana Transporter. A Marijuana Research Facility is an academic institution, non-profit corporation or domestic corporation or entity authorized to do business in the Commonwealth of Massachusetts. A Marijuana Research Facility may cultivate, purchase or otherwise acquire marijuana for the purpose of conducting research regarding marijuana and marijuana products. Any research involving humans must be authorized by an Institutional Review Board. A Marijuana Research Facility may not sell marijuana it has cultivated. A Microbusiness is a co-located Tier 1 Marijuana Cultivator, and/or Marijuana Product Manufacturer limited to purchase 2,000 pounds of marijuana from other Marijuana Establishments in one year. So what is the cannabis bond for? Regulations and final requirements are modified and added to so the current obligations imposed on surety bonds can will likely change. The Massachusetts marijuana surety bond requirement addresses the costs of decommissioning of marijuana establishment and is found in Section 500.101, "An applicant for licensure as a Marijuana Establishment shall submit the following as part of the Application of Intent: (c) Documentation of a bond or other resources held in an escrow account in an amount sufficient to adequately support the dismantling and winding down of the Marijuana Establishment" Currently the "escrow" amount required by the Commission appears to be $250,000. Further information about cannabis use, licensing of marijuana establishments can viewed on the Cannabis Control Commission's website here. 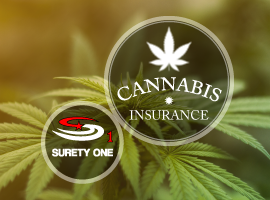 Massachusetts surety bond leader, SuretyOne.com is the premier underwriter of the surety bonds needed by both the recreational and medical marijuana sectors. We firmly believe in supporting the availability of cannabis products to patients that benefit from them and will provide bonding to ethical cultivators of marijuana where state law permits. We will consider applications for a Massachusetts marijuana business license bond for start-up entities and established operations regardless of credit or financial statement condition. For further information contact us at (800) 373-2804, email Underwriting@SuretyOne.com or click here for a live chat.